When it comes to sandwiches, sometimes we're looking for no buns, hon. 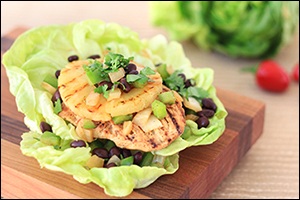 These two new recipes replace carb-heavy exteriors with crisp lettuce leaves... Mmmmm! In a sealable container (or sealable plastic bag), combine orange juice, jerk seasoning, and cayenne pepper. Mix thoroughly. Add chicken, and flip to coat. Seal and refrigerate for 1 hour. Bring a grill pan (or skillet) sprayed with nonstick spray to medium heat. Add chicken, reserving excess marinade. Cook for 4 minutes. Flip chicken. Lay pineapple on the pan. Add onion, bell pepper, and excess marinade. Stirring veggies occasionally, cook for 2 minutes. Flip pineapple. Stirring veggies occasionally, cook for about 2 more minutes, until chicken is cooked through, veggies are soft, and marinade has been absorbed. Stack two large lettuce leaves, and place chicken in the center (or stack two extra-large leaves, and place chicken over one half). Top with pineapple, veggies, beans, and cilantro. Finish with remaining two large lettuce leaves (or wrap the extra-large leaves around the filling). To make the sauce, in a small microwave-safe bowl, combine crushed tomatoes, basil, 1/8 tsp. garlic powder, 1/8 tsp. onion powder, and a dash each salt and pepper. In a medium bowl, combine beef, Italian seasoning and remaining 1/8 tsp. garlic powder, 1/8 tsp. onion powder, and dash each salt and pepper. Mix thoroughly. Form into a 4-inch-wide patty. Bring a grill pan (or skillet) sprayed with nonstick spray to medium-high heat. Cook patty for 3 minutes. Flip patty, and cook for 3 - 4 more minutes, or until cooked to your preference. Meanwhile, cover sauce, and microwave for 20 seconds, or until warm. Mix well. Top patty with cheese. Cover and cook for 1 minute, or until cheese has melted. 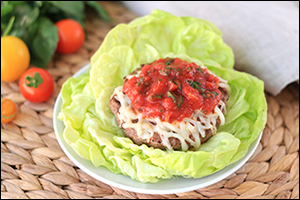 Stack two large lettuce leaves, and place cheese-topped patty in the center (or stack two extra-large leaves, and place patty over one half). Top with sauce, and finish with the remaining two large lettuce leaves (or wrap the extra-large leaves around the filling). We bet your buddies would love these recipes. Take a chance -- click "Send to a Friend" now. Today, July 30th, is National Cheesecake Day. Have you seen the new Fiber One Cheesecake Bars? Only 150 calories each, and so good!